At the Howland Preserve meeting on Thursday, Dave Buck reminded me of the question he posed back in 2006 at the first River Symposium. I had just given a short paper on “Europeans and the Susquehanna River” that quoted the opening lines of a poem by the famous German poet Johann Wolfgang von Goethe, “Nicht am Susquehanna, der durch Wüsten fließt.” At the time, I had just begun my work on the Shamokin Diaries and was immersing myself in the world of the Moravian missions in Pennsylvania. He asked if I had ever heard of “Friedenshütten,” a mission on the North Branch near Wyalusing. I replied that I had but was not that familiar with it. Dave, in his usual dogged fashion fashion, pursued me after the session and explained where the mission was supposed to have been and that it was linked to one slightly further up the North Branch, Sheshequin. And so my curiosity was piqued. When Paul Peucker was Archivist at the Unity Archives in Herrnhut, he had the foresight (as is his wont) to have their fantastic map holdings digitized and made searchable on the internet. 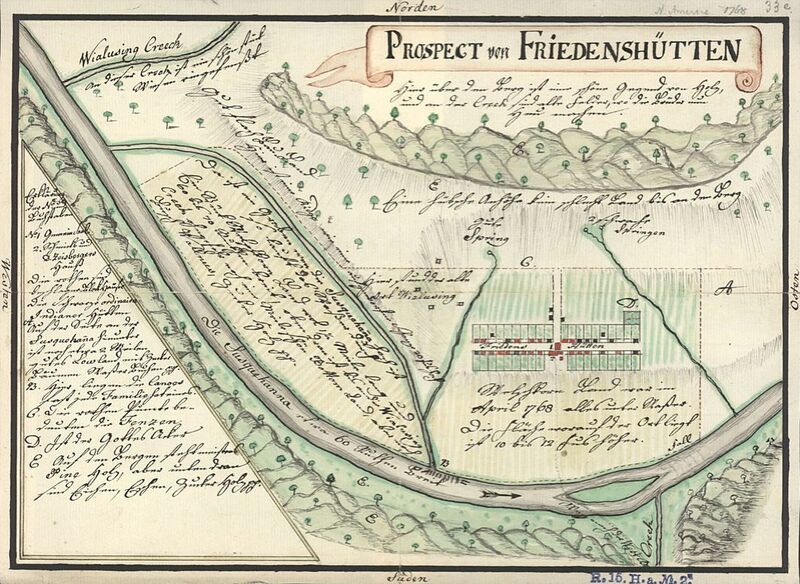 I went and searched and found the most glorious map of Friedenshütten that has since been written about and published in my article in the Journal of Moravian History. It was this map that I then showed my colleague Ben Marsh one fateful afternoon and he revealed to me the magic of Arc Map. Now I saw the power of rubber-sheeting, geo-referencing manuscript maps, being able to drape the digital image over a 3D topography and twirl it around like a dancer. From our original pinnings and drapings we were able to see exactly the location of the mission village in today’s cornfield and also identify the sad fact that the railroad that now carries the rocks and sand of the gas industry had been built right through the “Gottesacker,” the graveyard of the community. More research revealed the path by which Goethe had come to hear of this place on the North Branch and write these opening lines. 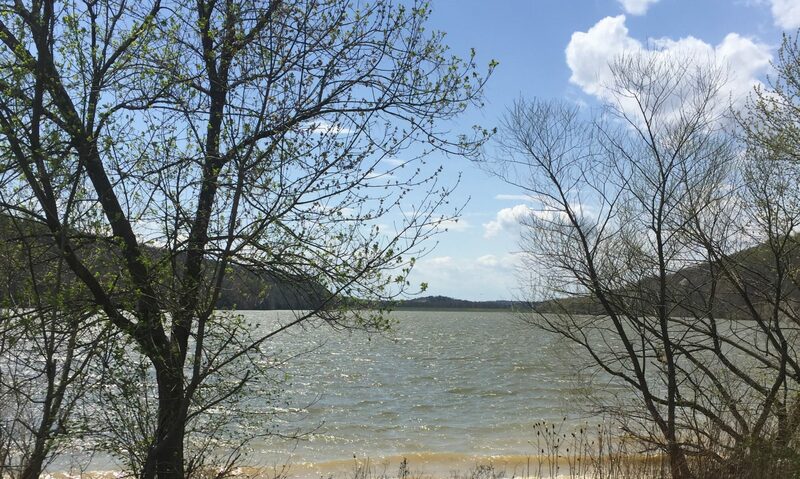 It also revealed the importance of this town on the North Branch that existed for only seven years and whose end was discussed even at its beginning. For those who read my previous post and delved into the paper I delivered on Nain, you know that the trail of tears of those Moravian Indians did not end in Friedenshütten. Cognizant of the instability of agreements and treaties, and aware of the political landscape of the pre-revolutionary colonies, the missionary David Zeisberger had already identified lands in eastern Ohio that might provide more safety and security for the Moravian mission. He was unfortunately proven wrong, but that is for another post to tell. While it existed, Friedenshütten was a thriving, busy, and strategically important village. From its beginnings in the spring of 1765, when food was scarce and the bears were not, to its dissolution in the summer of 1772, the town supported itself with its gardens of produce, and seasonal hunting and shad fishing. It hosted numerous parties of visiting Indian nations, some very large and very hungry, many coming for political parley, some coming to visit their family members who had converted. Reading the mission diaries that still exist only in manuscript form, but in a script far more legible than Shamokin’s, a picture emerges of a vibrant community with a school, a Gemeinhaus complete with oil paintings and bell, log houses with glass windows, or houses built with bark. The temptation to start the transcription of the diaries is huge. But, as an interim step I have created a chronology of the mission from entries in the Fliegel Index of the Records of the Moravian Missions. This chronology can give you an idea of the events that the Archivist of the Northern Province deemed important in the 1950s. There is much that is missing that we today might also wish to note. But this is a start, a beginning in the process of bringing a place alive that is so much more than a point on a map.